I have an Instagram account - please follow for a more 'on the pulse' news feed. alfie_creates is my username for all ye instagrammers. Private viewing and hearing on Friday 5th May 6 - 9pm. Additional performance on Sat 13th 3 - 5pm. Come and look/listen to my recent mixed media landscapes with an extra slathering of singing on top. Collaged materials and papers layered with tones of music and paint form interpretations of local scenes through art and song. There is lots of news to catch up on... 1, 2, 5... go! As I drove up to start competing in Paint Out Wells in September - windscreen wipers on full, heating on full blast, waterproof trousers at the ready, thermal underlayers gently warming my tiny, goosepimpled body - I thought, gee, what an ideal weekend for painting, nay, COLLAGING outdoors in the elements. Three days later and upon the final brush stroke and splattering of P.V.A, the sun finally made an appearance. A highlight was befriending a fellow artist whilst squatting under a beach hut, occasionally dashing down the beach to catch an errant scrap of paper. Oh, and of course producing five new works which can all be seen in the Gallery section. I was completely humbled to win FIRST PRIZE for my 'sunrise' painting (inverted commas as there was no sun to rise). I also, kind of greedily, won a commendation award for another small piece - needless to say, I am thrilled and very grateful. A month later and it was the turn of Paint Out Norwich. Not quite the hurricane levels of Wells but still the thermals featured. It was an inspiring couple of days, chatting to the public and the usual act of convincing them that I have a fixed abode. The competition peaked with an exhibit at Norwich Cathedral Hostry which displayed the incredible and varied artwork of the artists. I was honoured to win the prize for the mixed media category for my painting 'Guildhall aglow' - capping off a sensational Paint Out season. Check out www.paintoutnorwich.com for extra info and images of all the artists' fabulous work. In other news, I've had a couple of wonderful school workshops, starting at my old haunt: Farlingaye High School. I explored the theme of 'origins' with the sixth form students; transforming old clothes, magazines and scrap material into evocative landscape creations -pictures can be seen here. I also worked with the lovely children at The Priory School in Bury St. Ed's as part of the Artworks free school workshop scheme. I can't tell you how much I enjoyed creating a communal collaged river piece - a truly inspiring morning. Now, back to the present! I have lots of new work - mini, massive, medium sized, calendars and cards - which can all be viewed at Spiral Gallery or sussed out here on me websoite, buh. I'd like to thank you for the support and wish you a Merry Christmas and New Year - see you on the other side! I'd like to invite you the annual Artworks exhibition, featuring myself alongside 30 top notch East Anglian painters, printers, sculptors, ceramicists, butchers, bakers and candlestick makers. Additionally, I will be giving a 'Demo Day' at the barn on Sunday 2nd Oct - come say hello! The accompanying pic, 'Gorse and birch', demonstrates my deep fascination with all thing foresty. This year's exhibition will spotlight this - shining a light on the dark jungles, the enchanting woodlands and the power of nature. Do come along, you're sure of a big surprise! Other distant yet significant elephants on the horizon are a couple of Paint Out competitions, which involve taking to the great outdoors and completing a number of works over a few days, all in the public eye. 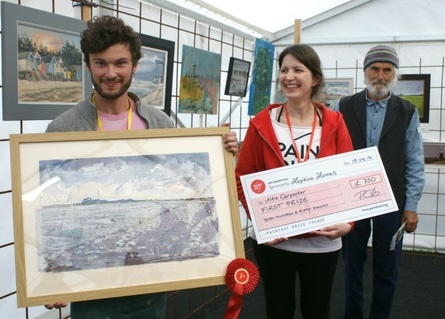 Last year I enjoyed a 2nd place finish and a CASS ART bursary prize from Paint Out Wells and Paint Out Norwich, respectively - a sizeable consolation for being mistaken for a homeless man at occasional points during the contest! Finally, thanks to those that donated towards the painting in Leeds and therefore entered the mini artwork raffle, you're ace! I will be drawing the golden ticket soon. If you have no idea what I'm on about, then click here! The donated painting 'In your element' displayed in the atrium of St James' Hospital, Leeds. I can't contain my excitement any longer.... I haven't tallied up every penny yet but I can reveal that the total funds raised from the 'Circulation' exhibition at St. James' Hospital, Leeds, sits at around £4000! Thanks to all those that have supported the cause, it's been truly spectacular. The fun doesn't end here though...oh no! One large painting entitled 'In your element' has been donated to the hospital and I have (rather ambitiously!) created a fundraising page to try and generate the money it would have generated had it sold. The Teenage Cancer Trust, Macmillan and Yorkshire Cancer Centre are a tremendous help to those going through cancer and they will be benefiting from every donation. To make a contribution please go to http://uk.virginmoneygiving.com/AlfieCarpenterPainting. EVERY DONATION WILL PUT YOU INTO A RAFFLE WHERE YOU CAN WIN AN ORIGINAL MINI ARTWORK WHICH I'LL PAINT FOR YOU!! Today, I was honored to be the guest judge at Hardwick Middle School's final art exhibition. The talent was truly inspiring and if i could've, I would've given everyone a prize! Lovely stuff. As I am now living in Norwich, I thought I'd herald my newfound residence by exhibiting some work right here in this fine city. The Giggly Goat will host a selection of my recent works, some of which showcase this beautiful city. Don't worry, Suffolk, I still love thee. Alongside this, Giggly Goat's sister boutique - The Hare and Hen in Burnham Deepdale - will also be entertaining some of my work. Quite a collection of animals going on over the Easter period - Goats, Hares and Hens. Make sure you catch at least one of them! Baaaa. In other completely unrelated to animal news, I had a wonderful day of workshopping at Thorndon CEVPC Primary School in January. Once again, I was inspired and amazed by the childrens' imaginative and artistic outlook. ICYMI, I've added the full catalogue of work I completed for LONG TEETH in the music artwork section. Gander/listen at your own will. You are all invited, of course! This is a particularly special show for me as St James's Hospital is where I was treated for Leukaemia in 2011. Over a course of 3 years, I was a regular inmate at Jimmy's so it feels like a home to me, albeit a weird, sicky and bald one. All proceeds from sales will be going to a combo of charities that provided invaluable support - Yorkshire Cancer Centre, Macmillan and Teenage Cancer Trust. For more info and to see my progress with it all, check the Facebook event here. In October I took to the streets (and the Forum rooftop!) of Norwich for another Paint Out competition which culminated with an exhibition at Norwich Cathedral Hostry and the Maddermarket Theatre. I was honoured to be awarded the CASS Art Prize bursary for which I am extremely grateful. Hop over to the PO website to see my entries or visit the Gallery section where you can also view recent works from the Wymondham Arts show with Breckland Artists. In apple-related news, I was lucky enough to explore Aspall orchard and create some paintings, one of which can be spotted here, too. More to follow. As I alluded to a few months ago, I have some exciting news coming at the beginning of 2016...I promise I ain't fibbin'! In the meantime, much merriment and hearty happiness to you all! I spent the summer partaking in various arty activities including a marvelous few days at Chives Montessori school for 2 - 5 year olds, displaying work at Colchester Institute and prepping for the Artworks exhibit at Blackthorpe barn near Bury St. Eds (on until 27th Sept). Check the gallery section for the images. I have recently returned home from a wonderful week in Wells-next-the-Sea as part of a plein air competition entitled Paint Out Wells. Much fun was had creating 5 pieces over 3 days (including a 6am sunrise session) whilst scrambling around with scrap bits of collage in the wind. I even won 2nd prize! (for a painting not the scrambling although perhaps that helped). Pictures to follow but in the meantime check their website. And news just in...UPCOMING SHOW at WYMONDHAM ARTS CENTRE. 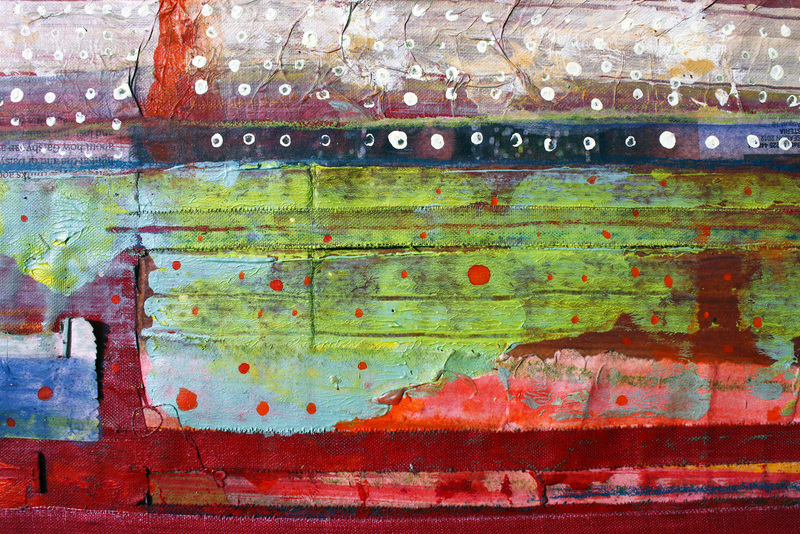 I am delighted to have been accepted into Breckland Artists. Come and see the fruits of the group. Lastly but not leastly, my work can always be seen at Spiral Gallery, Debenham. Ok, since my return to the ol' blighty at the start of March, many-a-new marvellous activities have been going on. I'll start with the fabulous days at Westley Middle School and Hardwick Middle School as part of the Artworks free workshops. Some really talented pupils creating unique responses - including a paper towel poppy field and a cardboard box cliff. I have also been working on a few commissions, such as the artwork for London based band Long Teeth. Check the 'Music Artwork' sector for the full portfolio and listen to the band's sounds here. Great stuff. Recently, I have completed my first set of Spring inspired creations. Their first public outing was at the Easthorpe Church Exhibition. Have a look at the 'Gallery' area right here or, as ever, come along to Spiral Gallery for a further nose around. Other exciting news to be announced later this year. Cliffhanger much? In case you've missed it, have a look in the music section at the new artworks I have completed for DOLLS - the London based musical duo. Check their website www.thisisdolls.com for upcoming gigs and to order the CD for yourself. I've had a fun-filled few weeks, including an afternoon at Great Finborough CEVC Primary School exploring layers and textures and also the aforementioned workshop at Farlingaye High. See below for the result of a year 7's imagination when capturing a poppy field - the use of ripped up worksheet is particularly good. Christmas announcements coming soon. Don't be a stranger! The wonderful Wiveton Hall Cafe in North Norfolk is the next venue to play host to my most recent works. Expect a tantalizing barrage of North Norfolk scenery, with even more tantalizing techniques. Find out just what has happened to the painting which blew away into the sand-speckled wind whilst in situ painting some seals near Blakeney...Did it survive?! Did it transform into a sandy masterpiece?! Will it make an appearance?! Check the image over there ( <<<<<------) for full details of the exhibit. 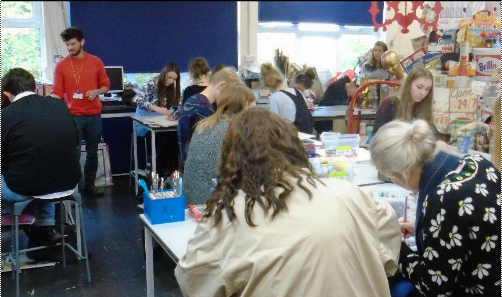 In other news, following on from a successful show at Blackthorpe Barn as part of the Artworks group, I have a few exciting schools' workshops on the horizon, starting with the 6th formers at Farlingaye High School this week. Check back here for the results. See above for some snaps of me and my wobbly easel in full flow. I am pleased with the paintings and even more pleased that I could marry my two loves - art and music. Although, I am most pleased with managing to keep the shiny euphonium absolutely splatter-less, despite its alarmingly close proximity. I am currently cooking up some new delights for upcoming exhibitions starting in September.....more details and other announcements to follow imminently! I have numerous things to report - are you listening carefully? Good! 1. I am absolutely delighted to announce my recent acceptance into Artworks. We are a group of around 30 East Anglian artists that organise an annual exhibition, encourage art in schools and the community and promote art in the region . Kind of like the knights of the round table for the art world, minus the chainmail. 2. Tomorrow sees me take my art LIVE to the stage! I shall be creating 3 large pieces as the South Suffolk Youth Orchestra tweedle-deedles through some terrific orchestral pieces. Trinity Park, Ipswich @ 5pm. 3. I have been cooking up some new creations (see above right), some of which are on display this week at Debenham church art exhibition. Check back here soon to suss them out or, as ever, come see 'em back at their crib, aka Spiral Gallery. Mayday mayday, it may be MAY! Incoming exhibition at the delightful Glandford Art Cafe, North Norfolk. 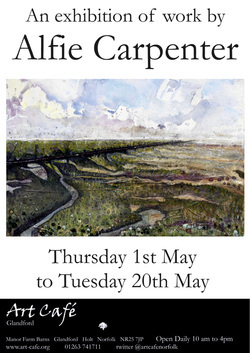 This is your chance to see my depictions of the Norfolk coast in their natural habitat. Also, their cheese scones are incredible. Check out www.art-cafe.org for directions and more info. I have a dozen, freshly primed and preened paintings up at Spiral Gallery, including the aforementioned Autumnal Suffolk series (below). Succulent Suffolkonian landscapes spanning Woodbridge, Coddenham and Debenham - I gone travelling, y'all! Here's a peeky sneak (right), but do come and have a look in the flesh. I have recently completed some designs for DOLLS - an exciting and ballsy duo of venerable musicians from London. View the full spectrum of designs under the 'music artwork section'. I would like to thank all that came to the opening weekend of the exhibition, much fun was had and many paintings now have new homes. Those that remain will still be on show until the new year so come and have a peek. If, however, you'd prefer to stay by the warm glow of your computer, then luck is with you because you can now view images of the paintings on this very website under the 'gallery' section. Hurrah! 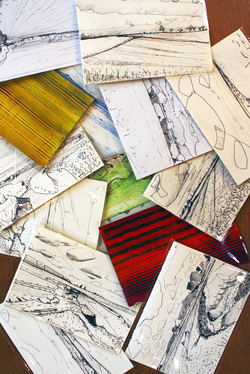 There are also a number of postcards left (see picture), taken directly from my sketchbook. Detail of a piece from my upcoming exhibition. I am pleased to announce that my first exhibition will be taking place in a few weeks. (a smaller exhibition will continue until the new year). There will be a number of works on display, large and small, long and short, most of them with a mixed media and colourful yumminess. The land I am celebrating varies from the wild North Norfolk coast, to the expansive Suffolk fields, delightful Devon and places only your imagination can fathom. Please come and have a perusal, even if just for the complimentary nibbles and wine.